A LifeWave research study was performed in 2006 to independently examine the effects of the Y-Age Glutathione patch on blood glutathione levels over a period of five days. After 24 hours of patch use, average blood glutathione levels rose by more than 300 percent over baseline. Not only that, but by the end of the five-day study period, they also stayed at that elevated level. Multiple studies have confirmed that the LifeWave Y-Age Glutathione patch increases blood glutathione levels in a safe and natural way! Blood Glutathione levels have been identified as being on of the most important indicators of our overall health. As the master antioxidant in the body Glutathione has a range of divers metabolic functions including acting as a free radical scavenger, "recharging" depleted antioxidants back into their active state (Vitamin C, Vitamin E, Vitamin A, etc. ), maintaining the immune system, supporting protein structures and removing heavy metals such as mercury through the liver. 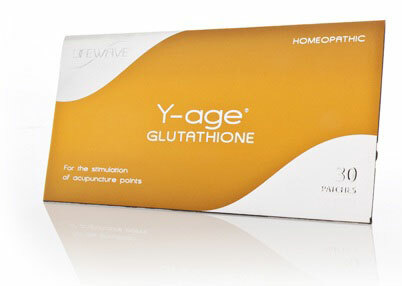 The LifeWave Y-Age Glutathione patch is a new way to increase Glutathione levels in the body. Our patch technology makes elevating Glutathione levels convenient, effective and safe. I was impressed with the ENERGY ENHANCER patches FOR ENERGY and the ICEWAVE patches FOR PAIN and SORENESS I used at the NFR!